Loose Moose Lodge is the "perfect" example of a lakefront, mountain retreat. 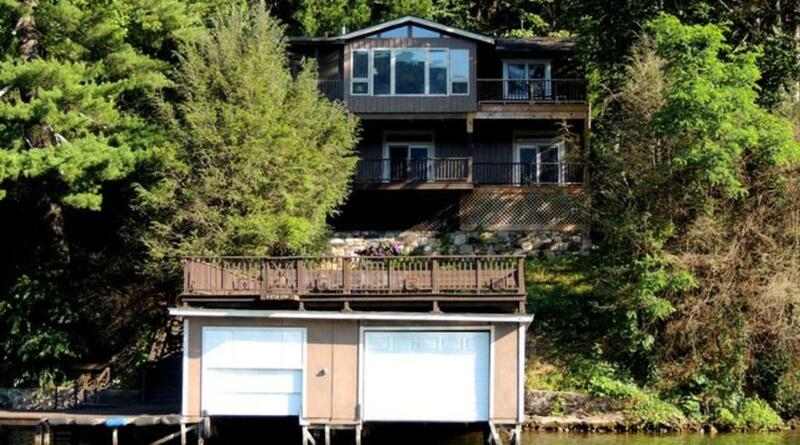 There’s lots and lots of windows and sliding glass doors so you get the "full effect" of being right on the water, including the incredible views of the surrounding mountain range. A large, beautifully furnished great room sits adjacent to the dining area. The large, round, wooden dining room table provides seating for 8, and sits just in front of the wood-burning fireplace. The kitchen is just off the dining area. There are 3 bedrooms (1 king, 1 queen, 2 twin), and 2 full baths on this level. Sliding glass doors in two of the bedrooms lead out onto small private decks. On the lower level, you’ll find the rec room w/pool table and ping pong, comfortable leather furnishings, a Fisher wood stove, and a 4th (king)bedroom, full bath, and laundry room. Two sets of sliding glass doors lead out onto the large covered deck which is perfect for an afternoon nap in the over-sized hammock. 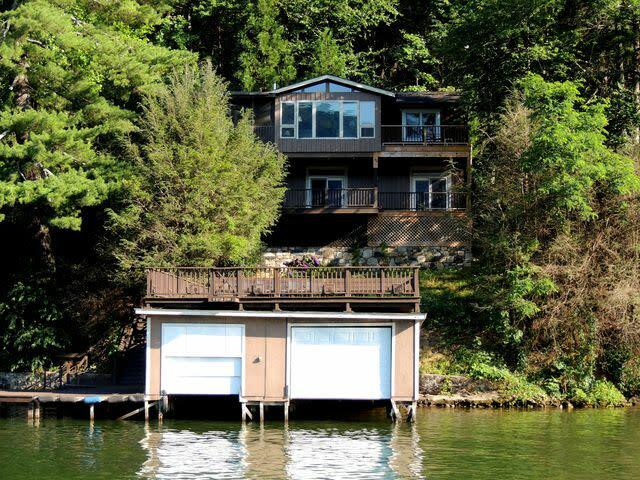 Around the side of the deck is a screened in porch with Adirondack furnishings for enjoying those wonderful summer nights overlooking Lake Lure. Perfect your tan or fish ’til the sun goes down from the large, roof-top boathouse deck. Steps lead down into the water so you can spend your afternoons floating, swimming, or fishing. Rent a pontoon for a day, or... for your entire stay. Our guests receive $100 off of a weekly pontoon boat rental!